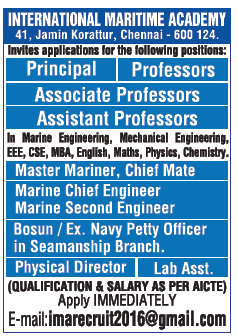 International Maritime Academy, Chennai has advertised in THE HINDU Classified newspaper for the recruitment of Teaching Faculty- Professor / Associate Professor / Assistant Professor / Principal plus Non-Faculty jobs vacancies. Interested and eligible job aspirants are requested to apply immediately from 31st March 2019. Check out further more details below. About College: The Merchant Navy mainly deals with transporting cargo and occasionally, passengers, by sea. It has different fleets composed of passenger vessels, cargo liners, tankers, Bulk carriers, Car carrier, containers as well as the other special types of vessels. Merchant Navy is the backbone of international trade, carrying cargo across the globe for Import & Export business.